TigerChef > Browse by Store Type > Catering Supplies > Chafing Dishes >< Roll Top Chafing Dishes > Winco 601 Madison Full Size Stainless Steel Roll-Top Chafer 8 Qt. Winco 601 Madison Full Size Stainless Steel Roll-Top Chafer 8 Qt. $80.17 Winco C-5080 Full Size Dallas Chafer with Gold Accents 8 Qt. $355.68 Winco 308A Vintage Round Stainless Steel Rolltop Chafer with Gold Accents 6 Qt. $320.11 Winco 108A Vintage Full Size Stainless Steel Chafer with Gold Accents 8 Qt. $139.99 Royal Industries ROY COH 4 Roll Top Stainless Steel Chafer 8 Qt. $629.51 Walco 54120G Grandeur Rectangular Roll Top Chafer 8 Qt. $1,101.10 Walco 53150 Hallmark Collection Oblong Roll Top Chafer 8 Qt. $980.98 Walco 53240 Hallmark Round Roll Top Chafer, 8 Qt. $980.98 Walco 53240CH Hallmark Collection Round Full Size Roll Top Chafer 8 Qt. $342.99 Cal-Mil 1368-13 Mission Lift Top Chafer 9 Qt. $325.67 Winco 101A Virtuoso Full Size Oblong Roll Top Chafer with Gold Accents 8 Qt. $325.67 Winco 101B Virtuoso Full Size Oblong Roll Top Stainless Steel Chafer 8 Qt. $140.00 Atosa AT721R61-1 Roll Top Chafing Dish with Gold Accents, 8 Qt. $110.00 TigerChef Stainless Steel Full Size Roll Top Oblong Chafer, 8 Qt. $314.11 Winco 103B Virtuoso Full Size Round Roll Top Stainless Steel Chafer 6 Qt. 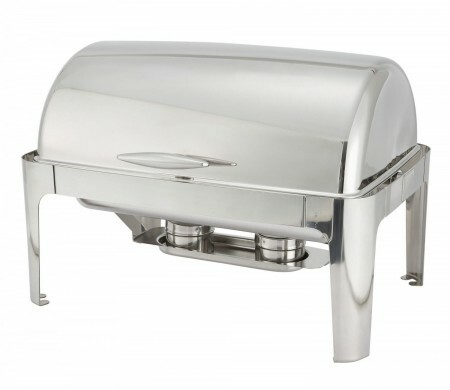 The Winco Madison Full Size Stainless Steel Roll-Top Chafer 8 Qt. is both economical and elegant. This roll top chafer is made from heavyweight stainless steel and features a roll top cover that has a full 180 degree and 90 degree intermediate stop options for serving flexibility. Your food presentation will be enhanced by this brilliantly polished chafer. Make this your chafer of choice for catered events and buffet tables at restaurants, hotels and catering operations. This chafing dish comes complete with food pan, water pan, dome cover and fuel holders. I love them. They look beautiful and are just perfect for our party. heavy duty. super nice looking. No issues. perfect product, works great. highly recommended. Is there a double pan available so I could have two items warming per chafer? Yes Winco SPF2 steam table pan will fit this chafer. How can I clean this chafing dish? Does this chafing dish keep food hot? Yes, definitely! This chafing dish will keep food hot for a few hours.